Perumbavoor (Kerala): When illiterate mason Jalaluddin Shaikh sought a better life seven years ago, he journeyed nearly 2500 km south from his home in Murshidabad, Bengal, to this riverine town in the greater Kochi agglomeration, known for its farm produce, plywood and sundry small-scale industries. Jalaluddin, 40, had heard stories of the opportunities in prosperous Kerala, and nearly five years, he was happy, earning Rs 22000 every month at construction sites, saving enough to send Rs 15000 back home. Everything changed on November 8, 2016, when Prime Minister Narendra Modi's demonetisation order invalidated 86% of India's currency. Jalaluddin's life worsened in June 2017, when the Goods and Services Tax (GST) widely criticised for its hasty, often chaotic, implementation came into effect. With the absence of cash and the complexities of the GST, business dropped and uncounted industries closed. The downturn was exacerbated by tensions in the Arabian Gulf the source of 36% of Kerala's income when many Arab countries turned against Qatar. That crisis was preceded by a general slowdown in the Gulf states since 2010, when the price of oil had dropped. As wages went unpaid and jobs and incomes were lost in the Gulf, Kerala’s construction industry suffered, as did opportunities for migrants in Kerala. Here in India's seventh richest state by per capita income, 2.5 million of 33 million people one in 14 were migrants, according to a 2013 study by the Gulati Institute of Finance and Taxation for the Kerala labour department. Mostly manual labour, they sent Rs 17,500 crore home every year. The government now believes about a million migrants are left, a quarter of the number projected for 2018. Although some questions were raised over the study's accuracy, it is the only available data on migrants like Jalaluddin. When we met him, Jalaluddin was standing stone faced, waiting for increasingly scarce work at a marketplace called Gandhi Bazar, one of Kerala’s largest labour hubs. Dressed in a bright, yellow shirt and stained black trousers, Jalaluddin now a skilled mason--explained how his income had dropped about 27% to Rs 16,000 per month since demonetisation. "Earlier I used to get work almost every day," he said, with some agitation. “Now it has reduced to three or four days a week at best." Jalaluddin lives frugally paying Rs 750 for a room that he shares with seven other workers in a Bengali-dominated neighbourhood and works long hours, leaving home at 4:30 am and returning around 6 pm if he finds a job. Otherwise, he waits until 9 am, when the market clears out. Jalaluddin's remittances to his wife and two daughters back home have dropped by a third, and when we met him between 7:30 and 8 am, he was, like other workers mostly Bengalis and Assamese still waiting to be picked by a labour contractor. 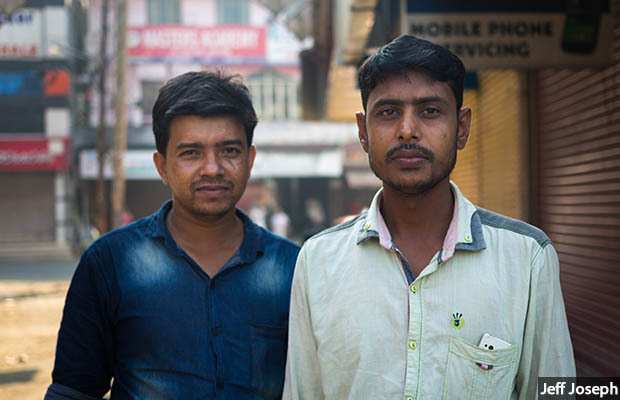 This is the third of an 11-part series (you can read the first part here and the second part here), reported from nationwide labour hubs places where unskilled and semi skilled workers gather to seek contract jobs to track employment in India’s informal sector. This sector, which absorbs the country's mass of illiterate, semi-educated and qualified-but-jobless people, employs 92% of India's workforce, according to a 2016 International Labour Organization study that used government data. By delving into the lives and hopes of informal workers, this series provides a reported perspective to ongoing national controversies over job losses after demonetisation and GST. The number of jobs declined by a third over four years to 2018, according to a survey by the All India Manufacturers Organisation, which polled 34700 of its 300000 member units across the country. In 2018 alone, 11 million jobs were lost, mostly in the unorganised rural sector, according to data from the Centre for Monitoring Indian Economy (CMIE), a consultancy. Gandhi Bazar is a man’s place. There are no women or items used by women in the market no sarees or bangles. Under blue tarpaulin, stalls of sugarcane juice, jalebi, samosa, pan masala, beedi and other cheap products exhibit their wares. At 8 am on a Satuday, a market once known for its early morning weekend bustle was deserted, save for the three groups of 20 men waiting for daily jobs. Primary employers who visit Gandhi Bazar for helping hands include individual house-owners, small-time building contractors, labour suppliers arranging labour for construction sites, plumbers, tile-laying contractors, electricians and painters. 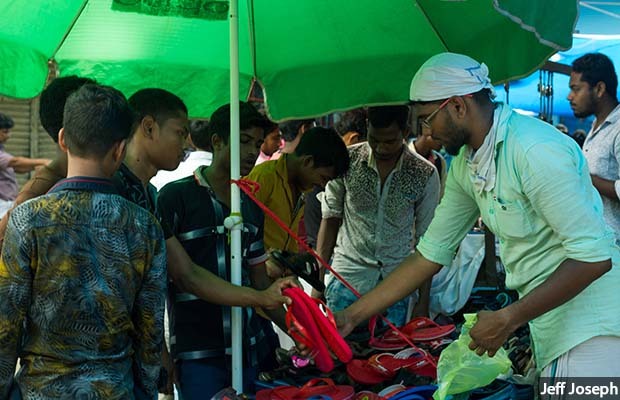 "Until a few years back, Saturday markets were overcrowded," said Najeeb K, a local vendor of flip-flops. In his early 20s, Najeeb has seen his Satuday sales drop 46% to Rs 8000 since 2016. "People could barely move around here before," said Najeeb. "Things have changed now." That is a view widely held across Perumbavoor. "Demonetisation first and then GST wreaked havoc," said MM Mujeeb Rehman, president of the Sawmill Owners and Plywood Manufacturers Association (SOPMA). He said the plywood industry could not pay workers in cash after demonetisation. However, said Rehman, they did not anticipate "the general shrinking of the economy, lack of cash flow and the increasing timeframe of settlement cycles to the scale that it would become infeasible (sic) to run units." Rizwan Mohammed, a young entrepreneur in his 30s and owner of two plywood manufacturing units, explained the situation thus: “Now there is no demand, boss, there is no cash flow in the economy. Plywood is needed for interior decoration and furnishing. When there are no infrastructure projects, who will use plywood?" "We should have had the infrastructure and financial literacy before rolling out disruptive moves like demonetisation," said Mohammed. "Even now, private banks won't open accounts for these migrants, as they hold very little cash. How are we to pay them? They should have thought through the effects on the unorganized sector." As for GST, he did not hold the general view that it was complicated: "It is good for us. It has made things much simpler, but it hasn’t worked as expected." In the real-estate sector, as we said, the absence of cash was exacerbated by the Gulf’s Qatar crisis and the drop in oil prices. "The Qatar crisis has affected the real estate and construction industry badly, and as it was the source of funds for many, demand has shrunk critically," said Vinodh Paul, a marketing and leasing consultant based in Calicut. "Demonetisation and GST had affected investor confidence rather badly; add the advent of the Real Estate Regulatory Authority (RERA) and its stringent norms, and now developers are wary, too." While demonetisation led to an estimated drop of 60% in Kerala's land transactions, GST confused buyers and delayed buying decisions, which in turn led to a pile up of unsold real estate, distress in the market and eventually a temporary real estate slowdown, said experts. "RERA is a good thing, but it has frozen construction in Kerala," said Paul. The real-estate slowdown hit the plywood industry, which hires fewer migrant labourers in areas such as Perumbavoor. The plywood industry in India is estimated to be worth around Rs 12000 crore, with 70% of businesses in the unorganized sector. Of this, Rs 1000 crore comes from Kerala, which, according to SOPMA, had 1,250 wood-based units, 350 plywood manufacturers and 458 veneer manufacturers registered in 2018. The number of daily-wage workers in these industries is unclear, but are estimated to be in the thousands. In 1996, the Supreme Court banned forest-based plywood factories, resulting in an industry collapse in Assam, which was then home to 80% of such units. This sparked a large-scale migration of skilled workers towards Kerala, then an emerging centre for plywood. The first wave of migrants from Assam were predominantly Bengali Muslims from Nagaon. A "consumption boom" in Kerala during the late 1990s and early 2000s led to a construction boom, which expanded the demand for workers. "It was a real crisis then, the lack of unskilled labour," said Twincy Varghese, a history lecturer at UC College, Aluva, referring to the late 1990s. With a student, Rubina Beeras, Varghese has studied the history of migrant labour in Kerala. As many educated Kerala youth found jobs as unskilled labour in the Gulf, the labour shortage of unskilled and semi-skilled workers in Kerala was accentuated by strong unions, who demanded better wages, better facilities and working hours. As wages rose, migrants streamed in, said Varghese. The "watershed period", according to Varghese, was between 2000 and 2006, a time of "steady increase in the inbound migrant labour to Kerala". These workers began in construction and fanned out to other industries, such as the plywood factories. "Migration has been a significant catalyst in Kerala state's economy," noted Benoy Peter and Vishnu Narendran from the Centre for Migration and Inclusive Development (CMID) in a 2016-17 study, 'God's Own Workforce: Unravelling Labour Migration to Kerala. 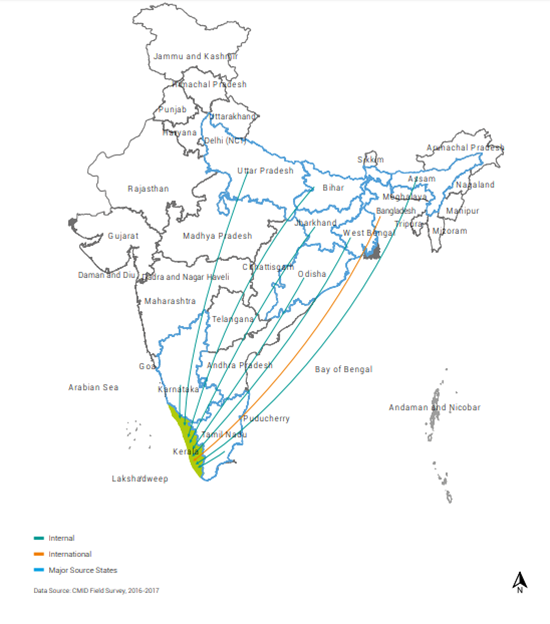 The CMID study identified the Nagaon (Assam)-to-Ernakulam and the Murshidabad-to-Ernakulam migration corridors as India’s longest over the preceding two decades. While workers from Murshidabad were freelance labourers in Perumbavoor and nearby areas, those from Nagaon worked in plywood and allied industrial units. But it is harder than ever to find the migrants who once streamed in. As he explained his tumultuous life, Feroz Shaikh, 33, a small-time labour contractor, offered a window to the uncertain life of the migrant. Educated till class six in Nadia, Bengal, Feroz moved to Kerala 19 years ago, when he was 14. He worked in several industries until he came to be a contractor, a middleman who guided workers to jobs. Meanwhile, his marriage back home broke and he became addicted to alcohol. He spends his money and spare time drinking, his hands shivering when he does not drink. Shaikh spoke to us while sober, describing how before demonetisation, factory owners asked for about 10-15 workers per unit; now they ask for less than five. "There is no work," he said. "Some plywood units have closed, the number of shifts has reduced, and many are unable to pay on time. How long will people work without pay?" Like others around him, Shaikh blamed the decline of Perumbavoor's plywood and construction industry on demonetisation and the introduction of GST. Tareef Ahmed, 27, who owns a gents saloon with a missing 'T' in Gandhi Bazar, rued the growing absence of the Assamese and Bengalis. "Both have vanished," he said. Those who remain, such as Raju (he does not use a last name), struggle along. After demonetisation, his income is down to less than Rs 4000 from a peak of up to Rs 12,000 a month although he said wages had not changed and he finds a job on about two days per week, at best, down from five. Upbeat despite his penury, the 24-year-old was a mason’s helper when he came at Kerala from Murshidabad at 17. Youngest in a family of six whose parents grow paddy, Raju--as a helper the lowest in the Gandhi Bazar food chain--shared accomodation with 10 others and said he earned just about enough to survive. He could send no money home. His broken phone was held together by several rubber bands. Other daily wage labourers at Gandhi Bazar also said wages remained largely unchanged after demonetisation since job rates were decided by labour unions. However, with the decline of the construction sector including plywood and timber the number of jobs reduced. The key to the unfolding loss of jobs, said a government official, was the plywood industry. "Plywood is what brought migrants to Kerala first, then construction," said Nazar TK, assistant labour officer at the state government's labour department. "Today, plywood is in bad shape. Many units have wound up. Construction has slowed too. Where will they find work?" The government does have some social-security nets, but it must first answer the question: How many migrant workers does Kerala have? The problem with tracking migrant workers is that they move on when they must and are wary of being tracked, as sub-inspector KG Jayakumaran Nair of the Perumbavoor police station pointed out. In charge of migrant affairs, Nair said the police did register migrants. "But then it was too impractical, as they seldom work at one place for long, and if we insist on registration, they just disappear the very next day," said Nair. "So we stopped." Now, the police send ledgers to each factory and ask owners to maintain copies of migrant workers photo identity cards. Still, they "don't have any kind of count" for numbers of those who arrived, left or are currently working in Kerala. "But for sure migrant workers numbers have dropped," he said. Kerala addresses inter-state migrant labour through the Building & Other Construction Workers (BOCW) Welfare Board. About 40,000 migrant workers have registered under the BOCW Act in Perumbavoor since its launch in 2017, and as of June 2018, 375,000 were registered statewide, said Nazar, the labour officer, who oversees the issue of biometric identities to migrants. These cards enroll migrants in a government scheme that allows them an annual health insurance of Rs 15,000 for in-patient medical care, Rs 200,000 for accidental death, and a monthly pension of Rs 1,200 on the payment of Rs 100 as premium after 10 years. The Aawaaz health insurance scheme, launched in 2017 under the BOCW board for migrant workers in Kerala, was then termed “first-of-its-kind”, but the state government has now claimed that it is handicapped as a lot of migrant workers prefer not to register themselves. No more than 73,058 workers are enrolled in Ernakulam district, of which 40,0000 are from Perumbavoor, according to labour records accessed by this reporter. Nazar acknowledged that it was “difficult to put a figure" on the number of workers in his jurisdiction. But his department’s inspections in Perumbavoor have revealed that from an average of 120-130 workers per construction unit before demonetisation, there were about 50 per unit in February 2019. The jobs that sustained them once no longer exist in Kerala. The only evidence of the once booming migrant market is the thinning crowds at Gandhi Bazar. This is the third of 11 reports. Here are the previous stories from Indore and Jaipur.